Dream Catcher Crochet Flip Flop Sandals - Free Pattern! Once you’ve finished Part 1 of your crochet flip flop sandals, it’s time to add some finishing touches including edging and ankles straps. 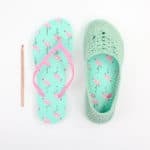 This free crochet flip flop sandals pattern is part of a collaboration with my friends at Lion Brand Yarn. This post contains affiliate links. 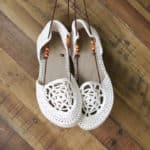 Earlier this week, I shared the first portion of the Dream Catcher pattern to make your own crochet flip flop sandals. This pattern is really pretty fun to watch come together because there just isn’t a ton of crocheting to do. 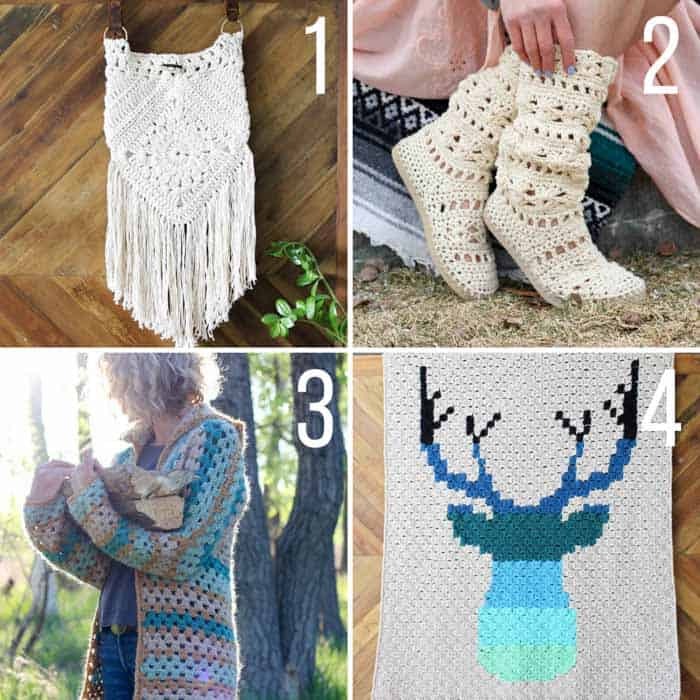 So if you haven’t yet, grab your hook, your yarn and the nearest pair of flip flops and head over to Part 1 of the free pattern. In Part 2 of the pattern, we’re going to attach the toe circle to the rest of the toe, clean up the edgings with some simple borders and add your choice of laces–suede or yarn-tastic. 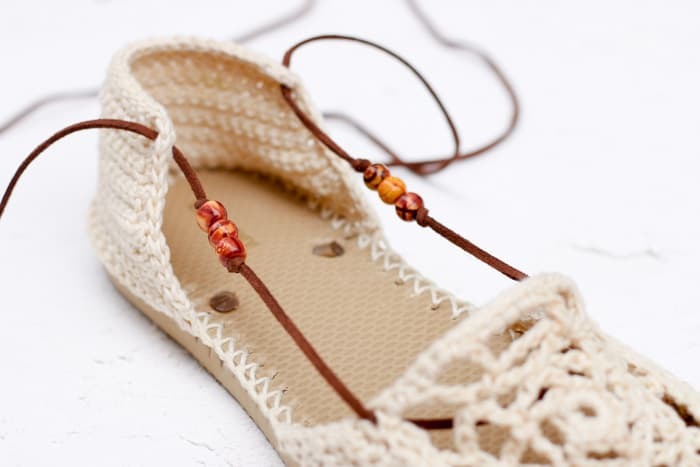 Your crochet flip flop sandals are this close to being done–let’s finish ’em up! Purchase the complete ad-free PDF with printable hole-poking ruler for $2.75 here. View Part 1 of the pattern here. 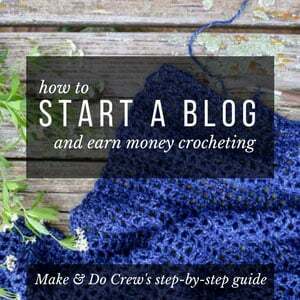 So you can spend more time making shoes and less time shopping, this pattern contains affiliate links at no extra cost to you. Leaving about 1/3 of an inch un-sewn at the beginning and end of the toe section, sew the edges of the circle and the toe together by going back and forth underneath the “v” shapes at the top of each edge. Sew one “v” from the toe section to one “v” of the circle. The small gaps will become the holes you thread the laces through. Using larger hook and one strand of MC, make a slip knot on hook. Insert hook at the 9:00 marked st of Foundation Round (3:00 marked st for left-handed crocheters) and slip stitch to attach yarn to the Foundation Round stitch where toe section begins. With WS facing, work Row 1 up side of toe section, over the exposed portion of the circle and back down the opposite side of toe section. Work over the tail of yarn as you go. Notes: Left-handed crocheters, reverse mentions of left and right. Row 1 (WS): Ch 1, work sc stitches evenly along side edge of toe section, work roughly 2 sc in each ch3sp and 3 sc in each ch4sp along top edge of circle, work sc stitches evenly along side edge of toe section, sl st into first empty sc on left side of sole; turn. This should result in two small gaps between where the circle meets the toe section on either side, which will be where laces are threaded through. See the photo below. Row 2 (RS): Ch 1, sk first sl st, sl st in each sc to end of row, sl st into first empty sc on right side of sole. Using larger hook and one strand of MC, make a slip knot on hook. 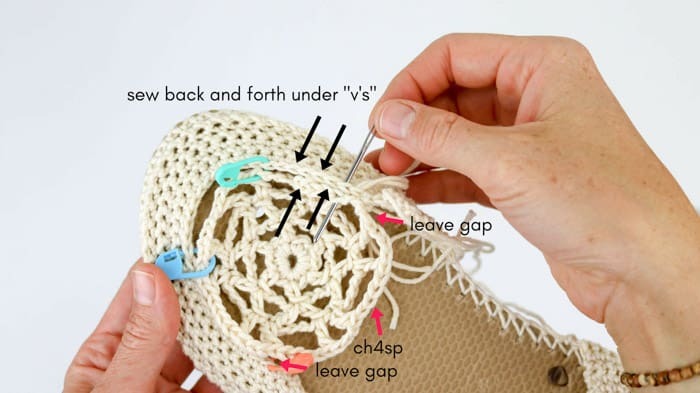 Insert hook at the 8:00 marked st of Foundation Round (4:00 marked st for left-handed crocheters) and slip stitch to attach yarn to the Foundation Round stitch where heel section begins. With WS facing, crochet Row 1 over edge of existing heel section. Work over the tail of yarn as you go. Row 1 (WS): Ch 1, work sc stitches evenly along side edge of heel section, at corner ch 3, work sc stitches in each sc along top edge of heel section, at corner ch 3, work sc stitches evenly along side edge of heel section, sl st into first empty sc on right side of sole; turn. The extra chains should result in two small holes at the upper corners of the heel section, which will be where laces are threaded through. See photos directly above and below. Row 2 (RS): Ch 1, sk first sl st, sl st in each sc and ch to end of row, sl st into first empty sc on left side of sole. There are two options for adding ankle straps. Choose whichever suits your style, or swap them out when you get bored! Leather Straps: Cut two 57” pieces of suede or faux suede laces. Thread laces as pictured in photo above, tying knots and adding beads as you desire. Crocheted Straps: Using larger hook and MC, make a 68” chain. Skip the first chain, sl st into the bottom “bump” of each chain to the end of the row. See photo below. Weave in any remaining ends with a tapestry needle. For shoe projects like this, I find it much easier to use a sharp tapestry needle like the one pictured above. 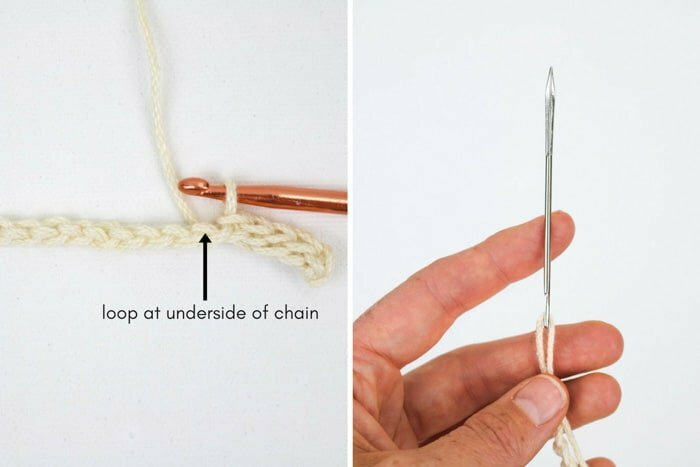 If you know what this specific type of tapestry needle is called, please leave a comment below! Thank you! 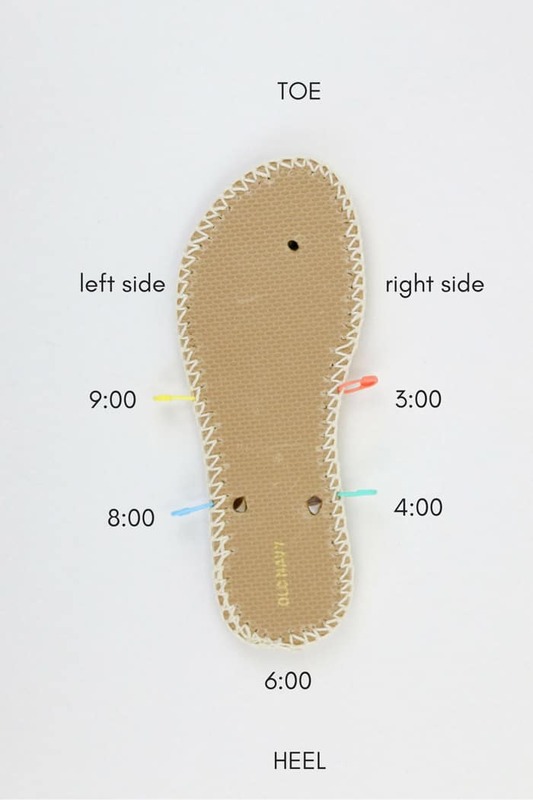 Optional: If you plan to wear your new shoes out in the elements, glue the flip flop toe plug back into place in the toe using a glue like E6000. Put on your new flip flop crochet sandals and head out to catch some dreams! Thank you so much for all of the amazing patterns! I made the 9:00 and 3:00 measurements too high up, so I had to skip a round on the circle. I also made a really, really long strap and laced it differently. My name is Barbara Smith and I saw that you were looking for what the name of the needle you were using in sewing your shoes made with flip flop soles is called. It is a SACK NEEDLE used in hand sewing grain sacks made with burlap and such. It is also used in leather and upholstery sewing and other heavy fabrics.. I hope this helps. Oh my gosh. Barbara! Thank you so much for this little piece of information! I’m so happy to know this answer! I used to use the sack needles while working at a wool processing warehouse, I have a few left ln different Size’s I now use them for upholstery and leatherwork, but will see ifI have a suitable one for making the sandals etc. This looks nice but I wonder if you can make this dream catcher design with a enclosed design—not open on the sides like your original summer slippers? Help, really struggling with the dream catcher circle- any tips please.